This meal was the result of two leftover ingredients: corn tortillas and lentils. At first I thought I’d use them for lentil tacos, until I realized I was going to have a hard time photographing them. #lifeofafoodblogger Quesadillas it was! I made the mistake of trying to make the whole meal in one evening, which led to a later than usual dinner. Next time, I’d prep the filling a day ahead of time and just assemble and cook the quesadillas, which won’t take more than a few minutes! I wasn’t sure how this would come together, but it worked really well. Even if you aren’t crazy about lentils, it’s hard to dislike anything that’s surrounded by gooey cheese! I loved that this was a million times healthier than most Mexican food you’ll find, and I promise it didn’t taste like health food! At the last minute I threw together a “salad” of avocado and tomato which ended up being a great addition. We liked it so much, in fact, that I rushed out to buy another avocado for us to use when we ate the leftovers! In total this made 9 quesadillas, which was enough for us to enjoy for 2 meals. I used the vegetables I had on hand, but you could easily throw your favorites into the mix. If you don’t want to deal with the mess of flipping quesadillas, throw the mixture over some salad greens and make some homemade tortilla strips like I did in this butternut squash and black bean salad. 1. In a medium-sized saucepan, cook lentils and broth over medium high heat. Bring mixture to a boil. Reduce heat and simmer, covered, until lentils are tender (25-30 minutes). 2. Meanwhile, heat oil in a large skillet over medium-high heat. Add onion, pepper, garlic, and salt, cooking until onion begins to soften. Add cumin, cayenne, and chili powder and cook an additional minute. Reduce heat to low. 4. Heat a tsp of oil in small skillet over medium-high heat. Place a corn tortilla in the skillet and top with a spoonful or two of the lentil mixture. Sprinkle with cheese and top with a second tortilla. Allow to cook for 3-4 minutes until lightly browned. 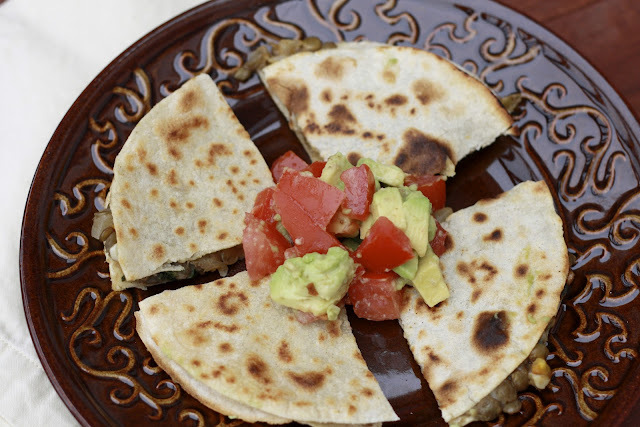 Using a spatula, carefully flip quesadilla and allow the other side to cook, 3-4 minutes. Repeat with remaining filling and tortillas. 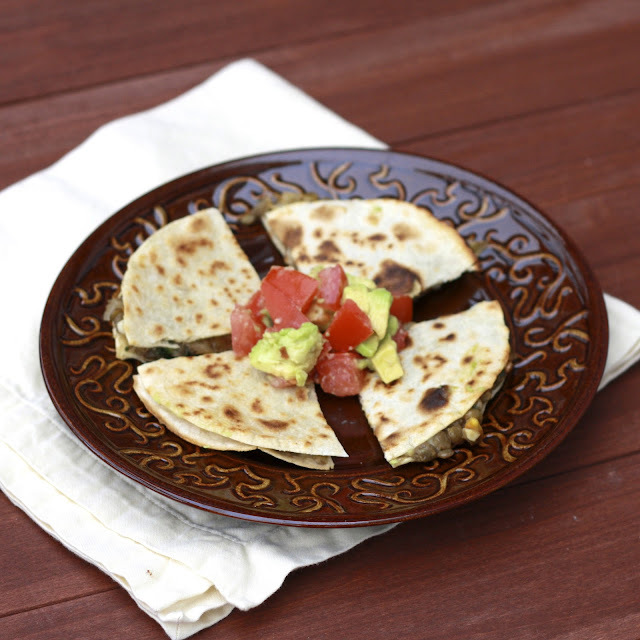 Use a pizza cutter to cut quesadillas into 4 pieces. 5. Dice tomato and avocado and place in a small bowl. 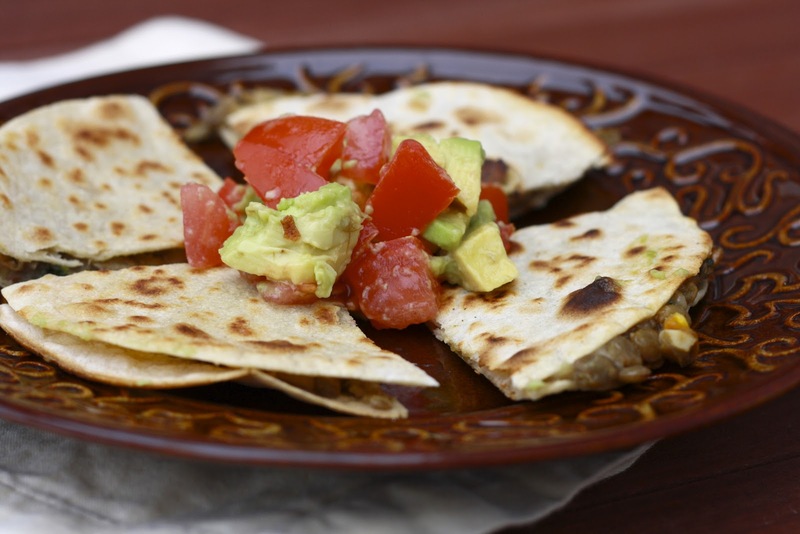 Serve quesadillas with avocado tomato mixture and sour cream.